Sheppy Brew Home-Brewery is really more of a figment of Sheppy's (the BrewMaster's) imagination than anything else. Sheppy does, in fact, brew beer. He actually brews quite a bit. He has even won a couple of awards for his beer. I think the beer is pretty good, but other than the BrewMaster, the BeerModel, and various friends, family, and a few co-workers, distribution is non-existent. The Brew Master does have a decent imagination. Of course, it must be a pretty legitimate establishment if it has its own web site and a blog. Well, ok, the blog is shared with other parts of Sheppy's life, but still. Just to be clear, though, Sheppy Brew Brewery does not and can not sell any of these beers. There is nothing at all commercial about this. It is just a hobby. The Sheppy Brew Home-Brewery got its start in 2009 after the BrewMaster received a Mr. Beer Home Brewing kit for Christmas 2008 from his little sister. To be honest, Sheppy did not really think much of the gift at first. His only taste of home brew up to that point in his life had been just completely horrible. He figured he would brew the two extract batches that came with the kit, and maybe brew once and awhile after that. He figured the hobby would quickly die. Sheppy was wrong. Boy was he wrong. He was really really wrong. The hobby did not die. It actually became an obsession very quickly. The thing he did not count on was the fact that you can actually make really good beer with very little effort. SheppyBrew's first beer was fantastic, and it turns out that making beer is fun. AND it turns out that chicks dig guys who brew their own beer. People consider you a rock-star. There are few hobbies that get you more admiration with as little effort as home-brewing. Of course, the Brew Master did the whole Mr. Beer hopped malt extract thing for quite awhile. He added different ingredients almost immediately, but for several months all his recipes were based on Mr. Beer's HMEs. Oh, he would add his hops and eventually got brave enough to start going to the local home brew shops for steeping grains, but then the work is still mostly done for you with HMEs. You almost can't call yourself a Brew Master if you use HMEs. Luckily Sheppy had that imagination that allowed him to be the legend in his own mind. And then, finally, the Brew Master came up with Phat & Tyred Ale. This was a great turning point for the brewery, because it was completely non-Mr. Beer and even a partial mash. And, it was completely awesome. After that, Sheppy did more and more recipes using only ingredients from local home brew shops. Sometime around here, Sheppy purchased Beer Smith software to help with recipe development. And, the beer just kept getting better and better. This whole phase of brewing lasted quite awhile. Finally, though, in the 3rd quarter of 2010, the Brew Master built himself a mash tun and purchased a propane burner so that he could do all-grain batches outside. So, now, most of the batches are all-grain. This allows the Brew Master to consider himself almost a real brewer. He has even started brewing regular 5 gallon batches rather than the tiny Mr. Beer size. He has even started kegging some of his beer. So, that is the Sheppy Brew Home-Brewery story so far. Yes, Sheppy is obsessed with brewing beer, but not as bad as lots of home-brewers. And, as far as obsessions go, this one isn't so bad. At least it gives the Brew Master and the Beer Model plenty of beer to drink. For a list of the beers currently "in stock", check out Sheppy Brew's inventory page. 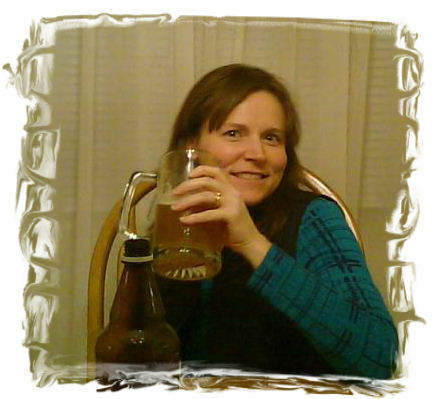 For up-to-date news and information about Sheppy Brew home-brewery, check out Brews on Sheppy's Blog. I have many more ideas for beers I want to brew than capacity to keep up. You can look on the Our Beer Recipes in the Future Brews section to see some of what is likely to come up in the near (near is a relative term) future. For awhile, I fooled myself into thinking I had a lineup of "regular" beers ... beers which I intended to keep on-hand most of the time. In reality, though, none of my beers are around often enough to be considered "regular". Of course, it is rare that I make a recipe exactly the same as it was before. I am always experimenting and trying to improve my recipes and processes. SheppyBrew sells some brewery merchandise through its SheppyBrew Store on Zazzle. There are various coffee mugs, hats, beer steins, and stickers available. If you ever want something additional offered, message us through twitter, facebook, or the Contact Us page on this site. As an obsessed home brewer, I always need that next great new thing to make my brewing experience that much better. If you would like to see the stuff I currently covet, click here and follow this link. You can follow the SheppyBrew Brew Master (esheppy) on twitter @esheppy. Of course feel free to leave facebook comments on any page of this website. I have added an RSS Feed to the site. http://www.sheppybrew.com/rss/RSSHandler.ashx. Not the greatest in the world, but should work to subscribe to. The Brew Master's blog has lots of additional SheppyBrew information at http://blog.ericshepard.com. And, you can certainly use the Contact Us form to contract the Brew Master at any time.